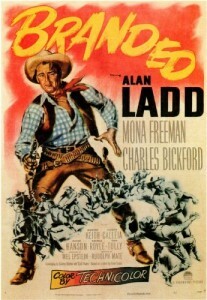 This is one of Alan Ladd’s more elusive, seldom-seen westerns, a Civil War story with an excellent cast. Ladd plays Brett Sherwood, a captain from Georgia who has gone west in April 1865 to Colorado Territory to meet up with “Gen.” William Quantrell. (Reality note: Usually spelled “Quantrill,” he was a colonel at best, and he was long dead by this time, having been killed in Missouri.) The opening scene shows the legs of a person in the town of Broken Branch dismounting and killing an assayer, hiding his identity. Since a rare form of Confederate ammunition was used, the locals figure that former Confederate soldier Lane Waldron (Arthur Kennedy), paroled after he was captured at Vicksburg, is responsible. A lynch mob captures Waldron and is about to hang him when Sherwood shoots the rope (a la Clint Eastwood in The Good, the Bad and the Ugly) and helps him escape. When Waldron discovers his rescuer is also a Confederate, he figures Sherwood killed the assayer, and, with the help of his fiancée Chris (Lizabeth Scott), he ungratefully captures Sherwood to turn him in and exonerate himself. Waldron has found a significant gold strike and wants to stay in the area to work it. 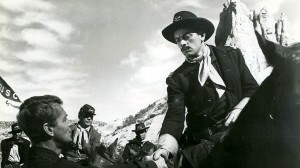 Sherwood (Alan Ladd) meets Gen. William Quantrell (John Ireland) in Colorado. 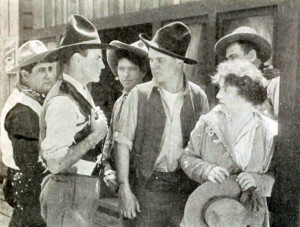 The upper hand shifts back and forth a couple of times until Waldron’s leg is broken in a scuffle. Sherwood flags down a passing Union patrol, which turns out to be a group of Confederates and their Ute sympathizers led by Gen. Quantrell (John ireland). Chris, a Union sympathizer who had lived in Lawrence, Kansas, when Quantrell raided there, is horrified. Sherwood works to keep the two prisoners alive, while Quantrell is pleased to have another military officer and kindred spirit. Gradually Quantrell reveals plans to foment a larger Indian rebellion (involving Comanches, Cheyennes, Utes and others) in the wake of the Civil War. 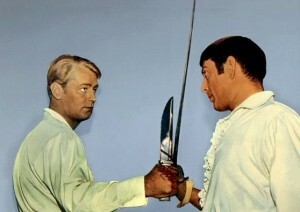 Chris is allowed to retrieve a doctor for Waldron, who is in bad shape, but the doctor is killed when Sherwood helps him escape. 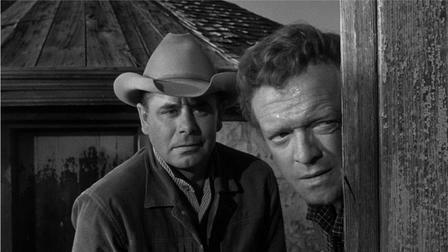 Against her better judgment, Chris is falling for Sherwood rather than Waldron, and Quantrell also becomes suspicious. As Sherwood helps Waldron and Chris defend themselves against the Utes, a real Union patrol attacks Quantrell. 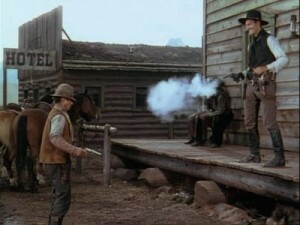 As Quantrell flees, Sherwood takes after him, and gets him in a final shootout. Waldron is dead of wounds by this time, and, as Sherwood recovers from his own wound, he confesses to the marshal that he killed the assayer. Sherwood had found a claim in Colorado Territory before the war, and the assayer had stolen it. Apparently Sherwood and Chris end up together. 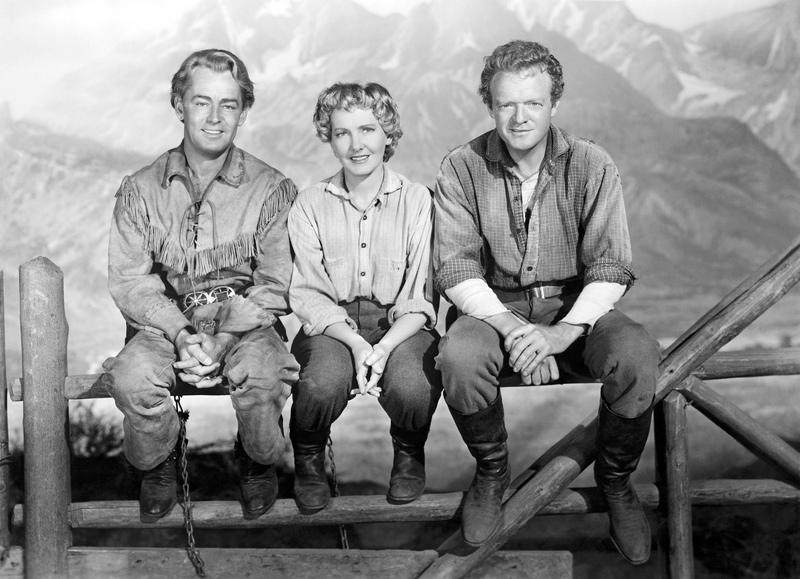 (We knew any character played by Arthur Kennedy was unlikely to get the girl.) Chris knows where Waldron’s gold strike was. And word reaches them that the Civil War has ended two days earlier. Lane Waldron (Arthur Kennedy), Sherwood (Alan Ladd) and Chris (Lizabeth Scott) make their last stand. 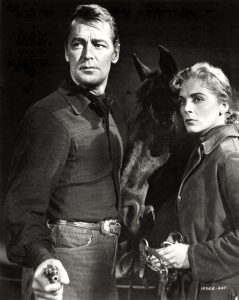 Lizabeth Scott, best known for her work in films noirs, is fine here in one of her two westerns (with Silver Lode ). Alan Ladd makes a sympathetic leading man, as usual, and is obviously becoming more comfortable in westerns than he was in Whispering Smith. 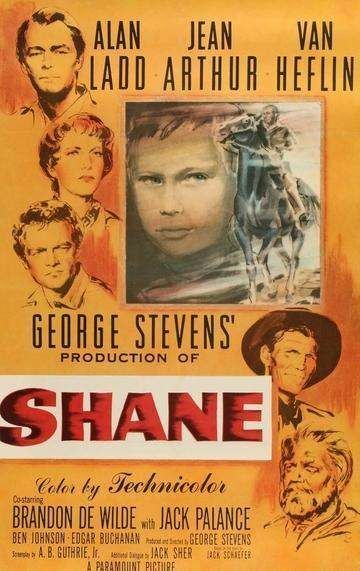 If you haven’t seen him in a western, you should start with Shane and maybe Branded, both from around the same time as this film; but this one isn’t bad aside from the obvious historical impossibilities. Character actors Jeff Corey and Neville Brand show up in small parts as a couple of Quantrell’s troopers. Jay Silverheels is Ute chief Little Crow. 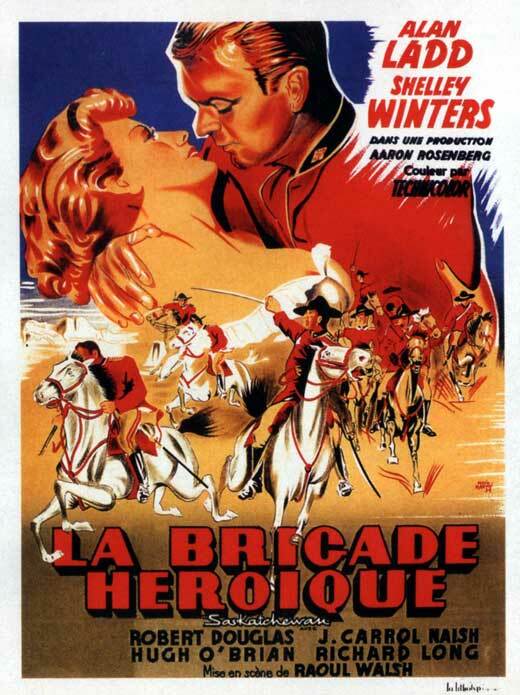 William Dieterle (The Hunchback of Notre Dame [the Charles Laughton version, 1939], Kismet , Portrait of Jennie ) was a mainstream director, not particularly known for westerns. The uncredited John Farrow directed a few scenes when Dieterle was unavailable during filming. Music is by Franz Waxman. 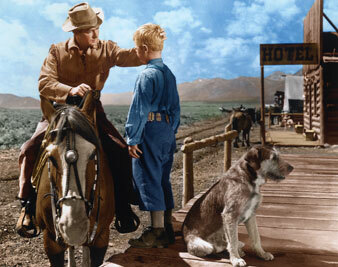 Shot in color by Charles Lang around Gallup, New Mexico, at 84 minutes. 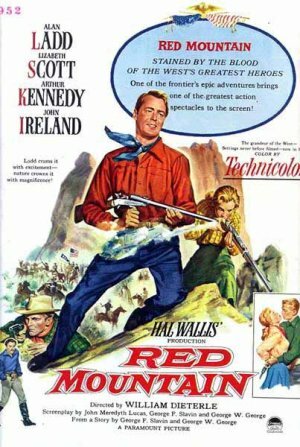 For another western that has Quantrell surviving the war and heading out west to continue his depredations, see Arizona Raiders (1965), with Audie Murphy. 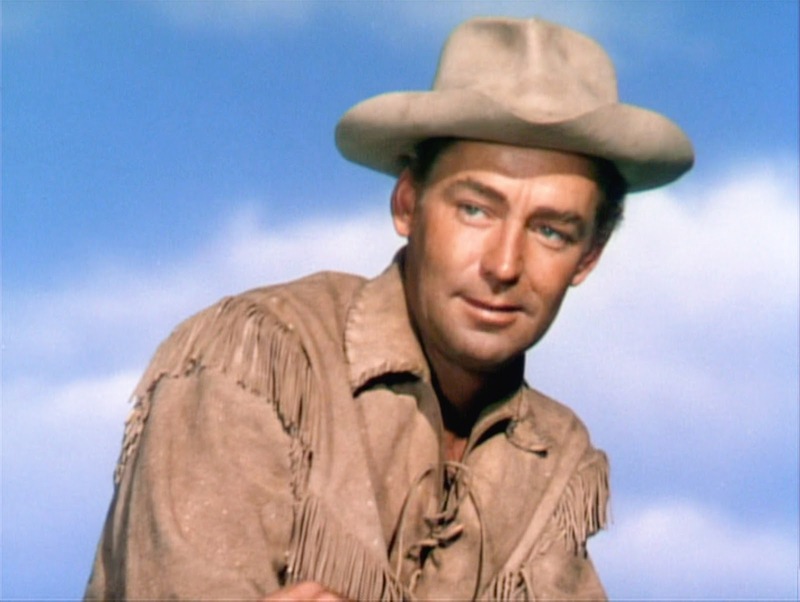 This entry was posted in Westerns Worth Watching and tagged Alan Ladd, Civil War, Native Americans (Indians) on July 9, 2015 by Nicholas Chennault. 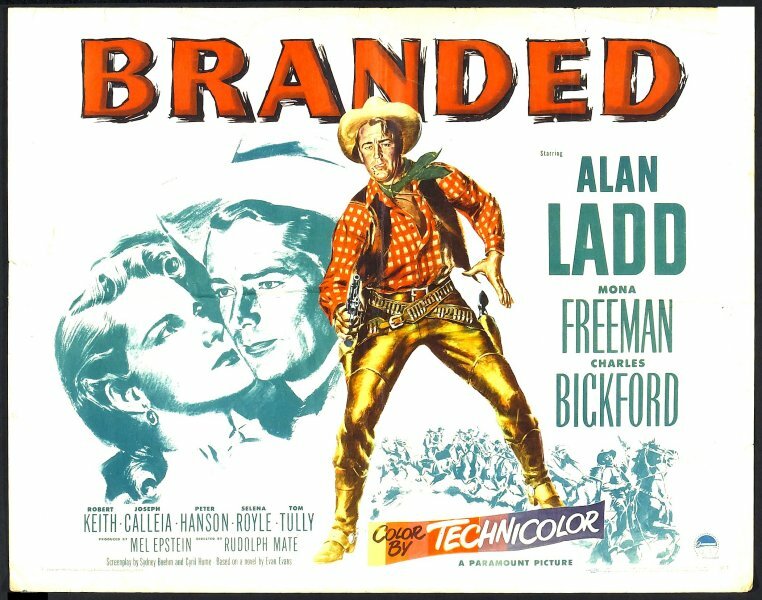 Alan Ladd made this one just before he revived his career by playing Shane, perhaps his biggest role ever and certainly his best western. He had been in movies for almost ten years at this point and was not quite as big a star as he had been after his breakthrough roles in This Gun for Hire (1942) and The Blue Dahlia (1946). 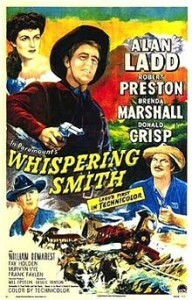 After Whispering Smith (1948), he moved more into westerns and made several good ones, including this. When we first see Choya (Ladd’s character), he is besieged by the men of a town where he has just killed someone who drew first on him. 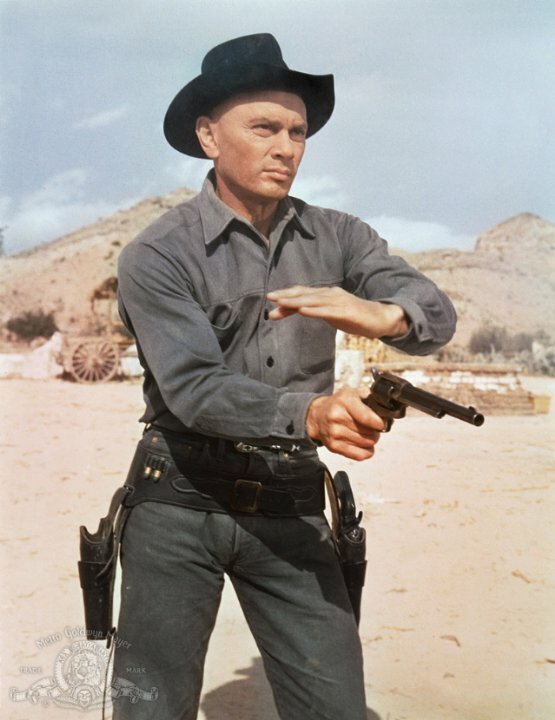 He wears two guns in the kind of fancy rig often seen in the 1950s, which mark him as a gunman, and he escapes from his predicament resourcefully. 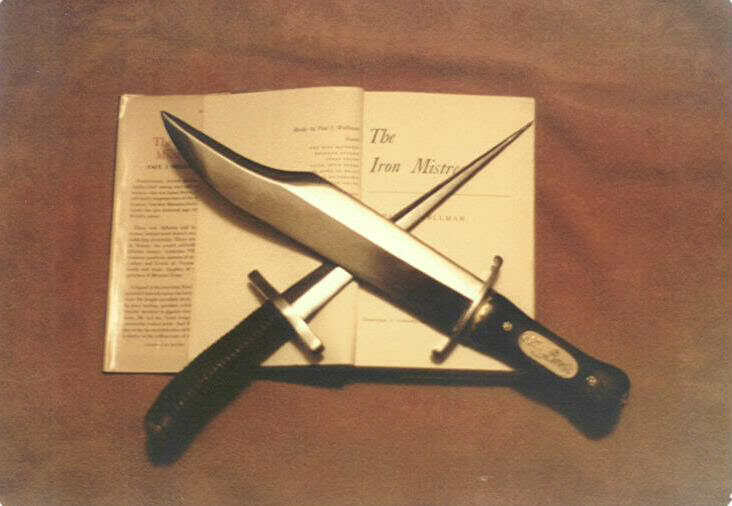 He is followed, however, by T. Jefferson Leffingwell (Robert Keith) and his partner Tattoo, who want to make him a business proposition. Leffingwell knows of a south Texas ranching family whose son Richard was kidnapped 25 years previously. The son had a birthmark on his left shoulder, and Leffingwell proposes that Tattoo give Choya the birthmark. He will then pretend to be Richard Lavery to win over the ranching family and take over their ranch. The story’s title refers to him after the tattoo. 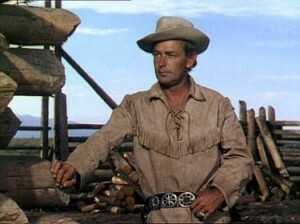 Choya (Alan Ladd) receives the tattoo that leads to the title. Choya (Cholla?) is Spanish for a type of cactus, and Choya shares the plant’s prickliness. That’s the only name he has, along with a spotted and murky past, and he agrees to Leffingwell’s plan, with certain provisos. After receiving the tattoo, he heads for for the Laverys’ Bar O Ranch and starts by getting a job there. Leffingwell, meanwhile, has killed Tattoo so as not to share the gains from this con, and has been told by Choya to lay low. [Spoilers follow from this point.] 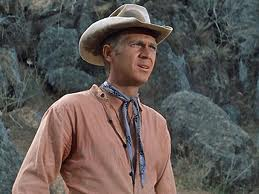 Choya gets a job on the ranch, despite suspicious foreman Ransome (Tom Tully), who doesn’t like him. 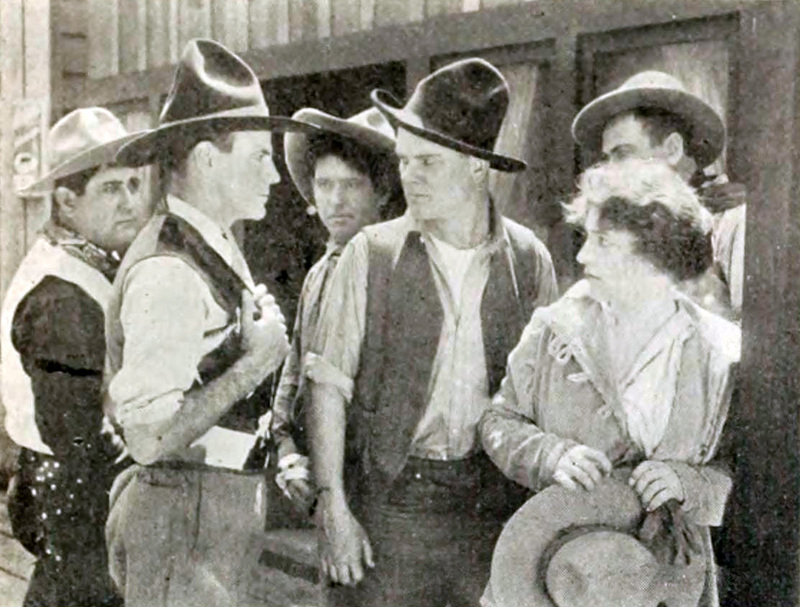 While fighting with the owner (Charles Bickford), his tattoo/supposed birthmark is spotted. 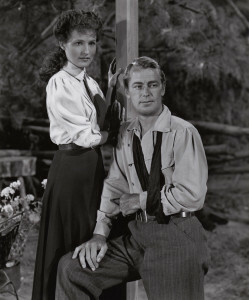 The family accepts him, including daughter Ruth (Mona Freeman), and he plays along, slowly and apparently reluctantly. Leffingwell shows up to press the matter. Choya/Richard is trusted to head a cattle drive to El Paso with Ruth, and he has second thoughts about this con. Finally he sells the cattle for more than $180,000 and makes sure that it goes back to the family. He has it out with Leffingwell, discovering that Leffingwell was the baby’s kidnapper and that Mexican bandit chieftain Mateo Rubriz (Joseph Calleia) has raised the child as his own son Antonio. Choya negotiates with the sleazy Leffingwell (Robert Keith) from a position of strength. After warning Leffingwell not to set foot in Texas again, Choya heads south over the Rio Grande toward the mountain retreat of Rubriz. Somehow he charms Rubriz and, while Rubriz is called away, manages to make off with Rubriz’s son Antonio (Peter Hansen), the Laverys’ real long-lost son, who doesn’t really want to go to Texas. Life is fine for him where he is. Rubriz was called away to see Leffingwell (we knew he’d show up again), who tells him what Choya’s up to, and Rubriz and his men give chase. It’s a long way to the Rio Grande, and Choya doesn’t know the shortest paths. 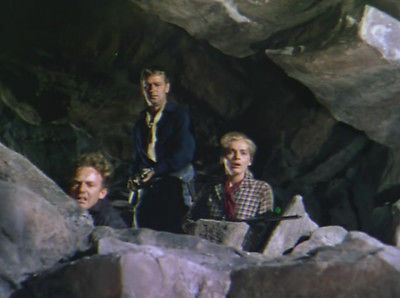 Antonio was wounded in their getaway, and they are trapped in a cave while Rubriz’s men unknowingly camp below. Choya has taken good enough care of Antonio, and told him enough stories of the Laverys, that Antonio is beginning to trust him and helps him steal horses to sprint for the river, stampeding the rest. 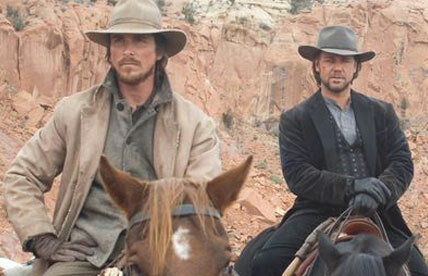 As Leffingwell takes a bead on Choya to shoot him down with a Winchester, the stampeding horses push him off a cliff. Once on the other side of the river, Antonio faints from his wound and Choya passes out from exhaustion. They are found there by Lavery and his foreman Ransome. 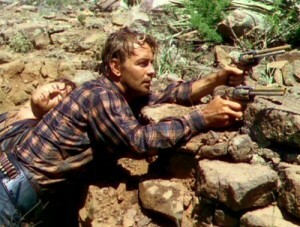 Having barely made it back across the Rio Grande, Choya (Alan Ladd, with Peter Hansen) prepares to shoot it out. As Antonio wakes in a bed on the Lavery ranch, Choya explains things to him. But Rubriz and his bandit band have found him, and Rubriz plans to kill both Choya and Antonio, whom he views as a traitor. Choya manages to talk him around, though, and it looks like Antonio will have a family on both sides of the border. As Choya makes yet another escape, he is caught by Ruth, and it looks like this time he will not get away so easily. Based on a story by Max Brand, the outline of this plot seems a bit contrived. But it works in part because Ladd manages to be convincing (if short) as the irascible Choya. 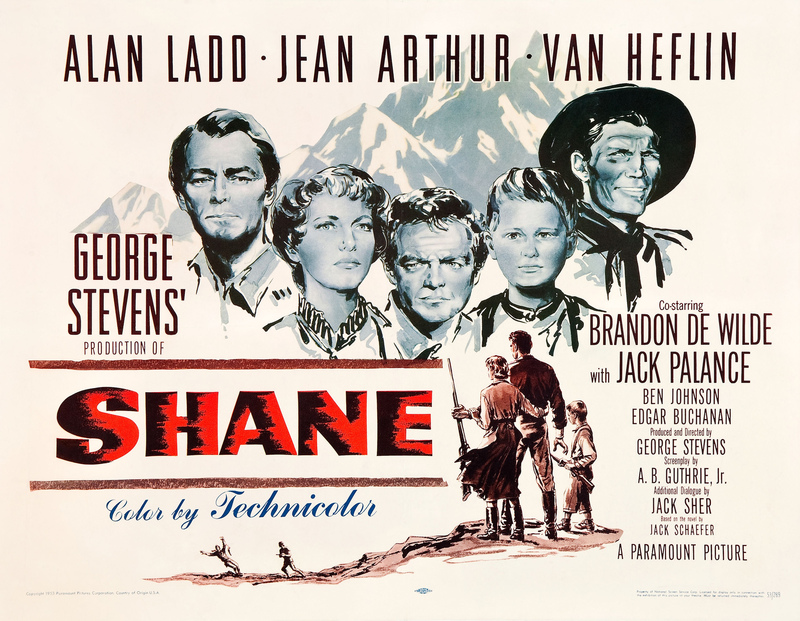 The supporting cast is strong, too, especially Robert Keith as the delightfully loathsome and unprincipled Leffingwell, Joseph Calleia as the bandit chieftain and family man Rubriz, and Peter Hansen as Antonio. 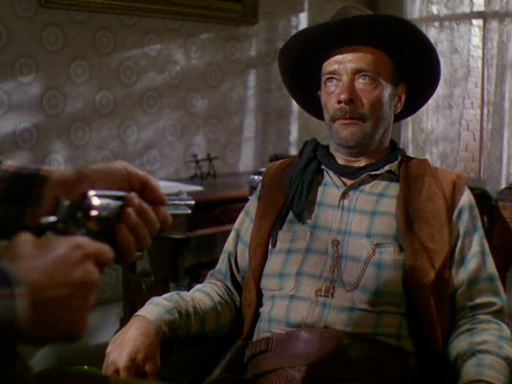 Calleia, who was of Maltese origin, often played heavies and Mexicans, but he was particularly good when the role called for some ambiguity, as his does here. 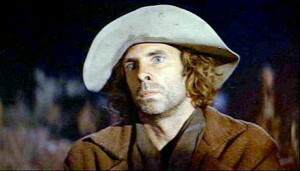 He could give his roles an enigmatic humanity, when in other hands they might just be stereotypes. Charles Bickford, said to be as irascible as Choya and hard to work with on other film sets (see The Big Country, for example), is fine here, as he was in Four Faces West with Calleia a couple of years earlier. Mona Freeman always played younger than she was in movies, and doesn’t have many nuances to her performance, but she’s fine here. This isn’t really what his two-gun rig looks like. 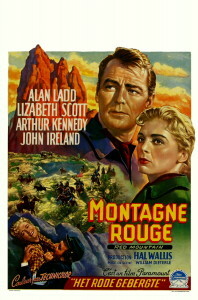 Shot on location in Arizona and southern Utah, with Charles Lang doing the cinematography in color in “academy aspect,” full-screen. Not terribly long, at 104 minutes, it nevertheless moves at what sometimes seems a leisurely pace. The movie was recently released on DVD by Warner Archive (Sept. 2013). This entry was posted in Westerns Worth Watching and tagged Adventures in Mexico, Alan Ladd, The Mysterious Stranger on October 6, 2014 by Nicholas Chennault. 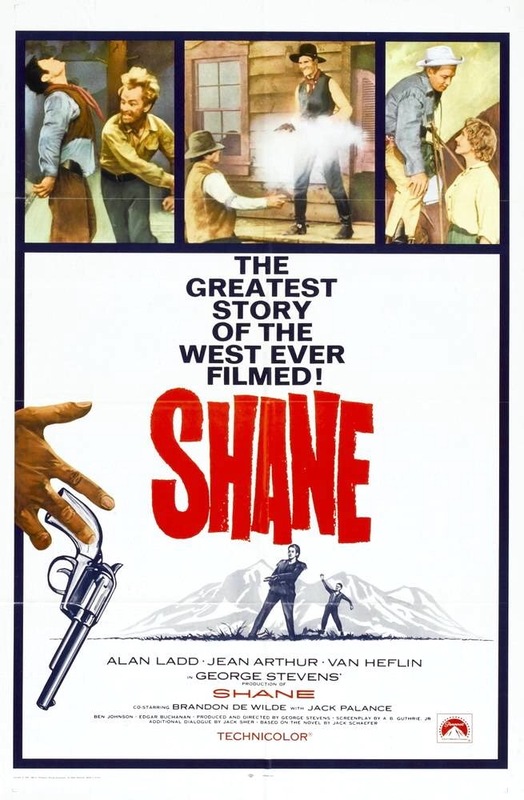 Biopic about Louisiana gambler, land speculator and knife fighter James Bowie, based on the novel with the same title by Paul Wellman. 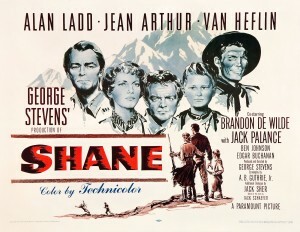 Shane (also with Alan Ladd in the lead) was made first, but this reached theaters earlier when Shane’s release was delayed. The poverty-stricken Bowie goes to New Orleans in the 1820s, where he meets poor painter John James Audubon, develops a few social pretensions for his backwoods family, and moves into the fringes of a higher social circle. Virginia Mayo has one of her best roles as the faithless Judalon de Bornay, a spoiled French creole aristocrat in New Orleans for whom Bowie isn’t socially upscale enough. 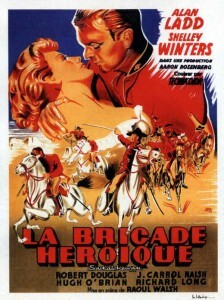 Most of the conflict in the film comes from wondering if they’ll ever get together, even after de Bornay marries a weakling. And from the periodic outbreaks of violence that Bowie’s involved in, which are of course unavoidable as matters of honor but never really his fault. Finally Bowie has had enough and drifts toward the frontier–specifically, to Texas. The film ends with Bowie’s marriage to the daughter of the Mexican governor of Coahuila, which includes Texas—not with the Alamo in 1836, where Bowie met his real end and became a Texas hero. 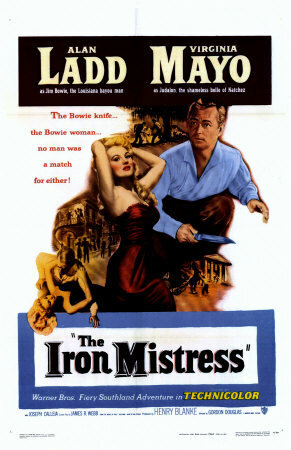 Just before that, dismayed by the carnage he has wrought (and his own not-very-savory reputation), Bowie tosses his legendary knife (the “iron mistress” of the title) into the Mississippi and is done with it forever. Ladd as Jim Bowie in a production still; the knives used in the film–Bowie’s big Bowie knife and Bloody Jack Sturdevant’s Arkansas toothpick. Much of this (especially his throwing the legendary blade in the Mississippi) is contrary to history, although the film contains some references to real elements of Bowie’s supposed story: John James Audubon, the Quaker painter of Mississippi birds and wildlife, for example; the legendary Arkansas knifemaker James Black; the Bowie brothers’ not-entirely-savory history as land speculators; and the Sandbar fight on which Bowie’s reputation as a knife-fighter was made. There’s a visually interesting sequence in which Bowie, armed with his knife, fights a duel with a man with a rapier in a darkened room, lit only by the occasional flash of lightning through the skylight. 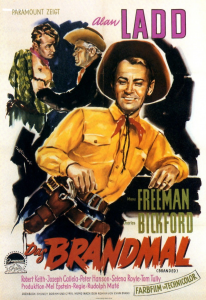 Some writing is clunky, the obsession with Judalon becomes tiresome, and there are several outdoor scenes that were very obviously done on an indoor soundstage, but it’s watchable. 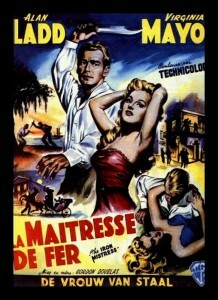 In color, with a score by Max Steiner. Not really much seen these days. 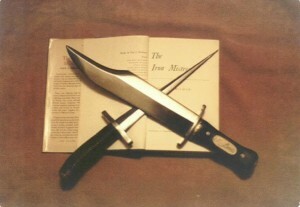 Bowie takes on swordsman Contrecourt in a duel, Bowie knife against rapier, to be fought in the dark. Alan Ladd is now remembered among fans of westerns principally for his role as Shane, but he made a number of other westerns: Whispering Smith (the last film version of an often-remade story about a railroad detective), Drum Beat (about the Modoc War), Saskatchewan (with Ladd as a misunderstood Mountie dealing with Sitting Bull’s Sioux in Canada), and The Badlanders (a western version of the caper story The Asphalt Jungle), for example. 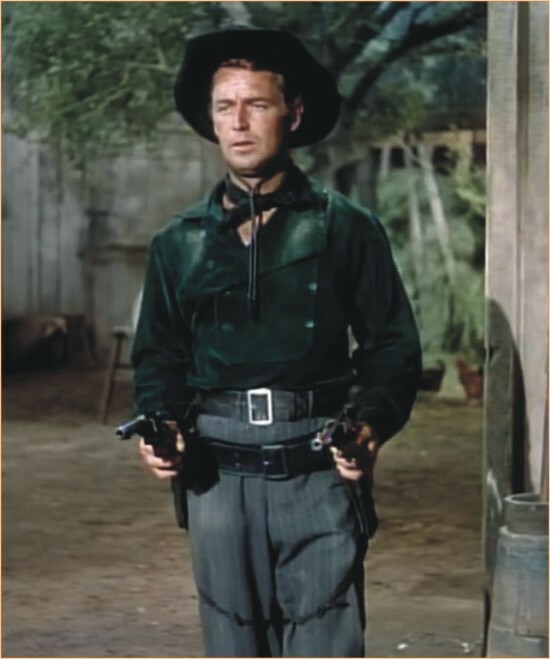 For other versions of Jim Bowie on film, see Richard Widmark in John Wayne’s 1960 version of The Alamo or Jason Patric in the 2004 The Alamo (which is a better movie). 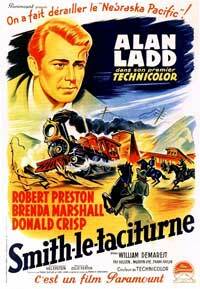 This entry was posted in More Westerns and tagged Alan Ladd, Virginia Mayo on June 16, 2014 by Nicholas Chennault. 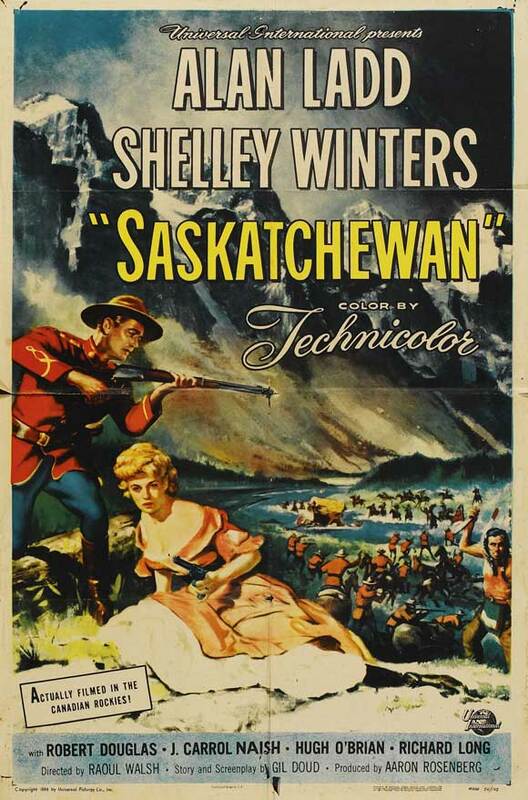 The very blond Mountie Inspector Thomas O’Rourke (Alan Ladd) has been raised by Cree Indian chief Dark Cloud and is now stationed at Fort Walsh about 20 miles north of the Canadian border with the U.S. Jay Silverheels is Cajou, his Cree foster-brother. The post-Custer Sioux under Sitting Bull and Crazy Horse are moving into Canada, threatening to overthrow the peace and lead a general Indian uprising. 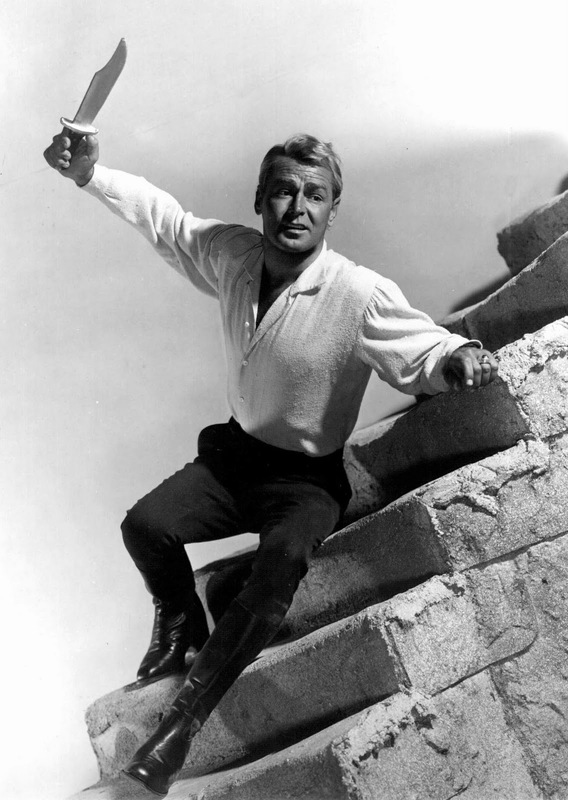 They’ve wiped out the group of which Montanan Grace Markey (Shelley Winters) is part, but she’s rescued by O’Rourke. It turns out she’s wanted for murder back in Montana. 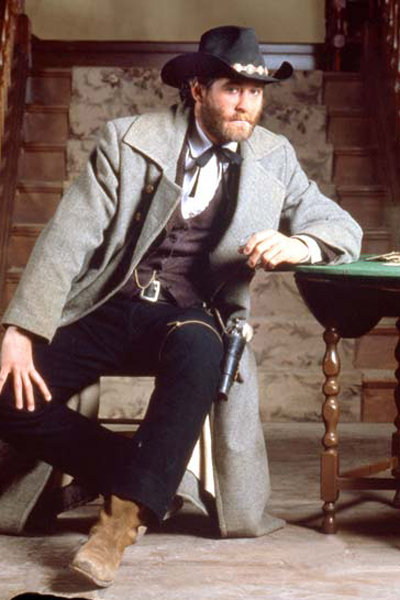 O’Rourke’s troop of Mounties has to get back to Fort Walsh to warn his commanders there about the Sioux, although they don’t believe him and O’Rourke’s in trouble for refusing to obey due authority. Hugh O’Brian plays Carl Smith, a malcontent Montana lawman with the troop, who’s always trying to get them to leave a wounded Mountie behind. 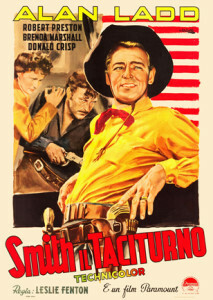 It turns out that Smith is (a) a U.S. marshal taking Grace back to Great Falls, (b) the brother of the murdered man, and (c) the actual murderer of his brother. That gets sorted out on the way to Fort Walsh. Banks, the Mountie commander, leads his men into a Sioux ambush, and it looks like Custer’s fate will be repeated north of the border. O’Rourke is able, with the help of the Crees, to save his commanders from the Sioux anyway, despite being locked in the stockade with his men. Inspector O’Rourke (Alan Ladd, out of uniform), Grace Markey (Shelley Winters) and Cajou (Jay Silverheels). 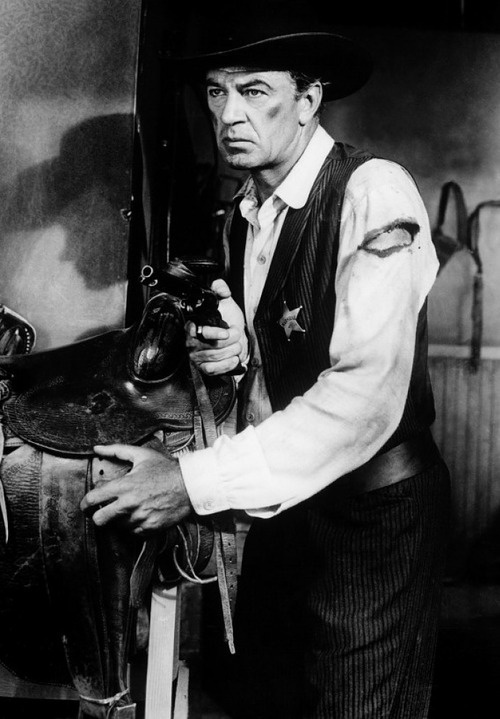 J. Carrol Naish is particularly good as a French-Canadian trapper and scout. Problems: There’s very little chemistry between the Ladd and Winters characters, who supposedly are fascinated with each other. Saskatchewan is actually a plains province and doesn’t have mountains like these. Sitting Bull made it to Canada for a couple of years (Crazy Horse never went there), but he had neither the resources nor the disposition to cause much trouble before eventually being forced back to the U.S. The Mounties have very clean red coats, and wear anachronistic Smokey the Bear-style hats that weren’t regulation until after World War I. O’Rourke wears one of the bright red coats while sneaking up to spy on the Sioux without much cover, and surprisingly enough they fail to spot him. 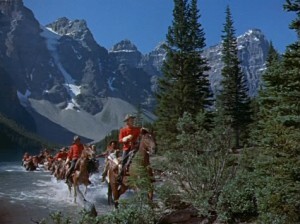 Filmed beautifully in color in Banff National Park (in Alberta, not Saskatchewan). 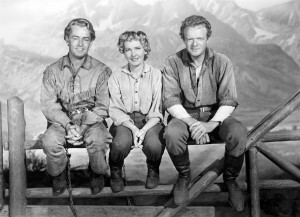 Robert Mitchum and Marilyn Monroe were said to be filming The River of No Return (actually located in Idaho) in the same locale at the same time. 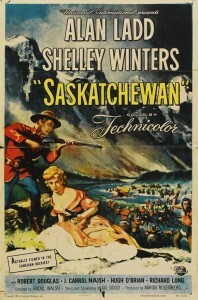 For another movie about Mounties, see Cecil B. DeMille’s North West Mounted Police (1940), with Gary Cooper, or The Wild North (1952), a manhunt in the frozen wastes with Stewart Granger, Wendell Corey and Cyd Charisse. 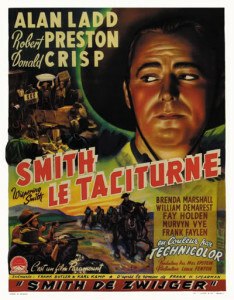 This entry was posted in Westerns Worth Watching and tagged Alan Ladd, Mounties, Native Americans (Indians), Northern Westerns, Raoul Walsh on March 20, 2014 by Nicholas Chennault.